Geese are as easy to cook as a turkey or big chicken, but with more fat. Brushing on a flavorful syrup near the end of roasting adds a dramatic glaze to the bird. Preheat oven to 350 degrees F. Rinse goose; pat dry with paper towels. Remove excess fat from cavity and neck. Sprinkle body cavity and rub the outside of the skin with marjoram and pepper. Skewer neck skin to back; tie legs to tail using 100 percent cotton kitchen string. Twist wings under back. Prick entire surface of bird with a fork. Place goose, breast side up, on a rack in a shallow roasting pan. Insert a meat thermometer into thigh meat (bulb should not touch the bone). Roast, uncovered, for 3 to 3-3/4 hours, or until the thermometer registers 180 degrees, drumsticks move easily in sockets, and juices run clear. Using a basting bulb, carefully remove and discard the hot, liquid fat as it accumulates during roasting. Baste goose with about 1/3 cup of Herb Glaze or Ginger-Honey Glaze during the last 15 minutes of roasting. Add vinegar or broth to remaining glaze as directed. Reheat glaze to serve as a sauce. Cover goose; let stand for 15 minutes before carving. 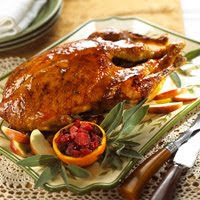 To serve, carve goose; pass remaining glaze to drizzle over sliced goose. Makes 12 to 16 servings. In a small bowl, stir together 3/4 cup orange marmalade, 1/4 cup snipped fresh flat-leaf parsley, and 1 teaspoon ground black pepper. After glazing goose, stir 1 tablespoon white vinegar into remaining mixture before passing as a sauce. In a small saucepan stir together 1 cup honey, 1/4 cup Dijon-style mustard, and 2 to 3 teaspoons grated fresh ginger. Heat through. After glazing goose, stir 1 to 2 tablespoons chicken broth into remaining glaze before passing as a sauce. Calories 1,026, Total Fat 83 g, Saturated Fat 25 g, Monounsaturated Fat 43 g, Polyunsaturated Fat 9 g, Cholesterol 225 mg, Sodium 187 mg, Carbohydrate 16 g, Total Sugar 11 g, Fiber 0 g, Protein 49 g. Daily Values: Vitamin C 21%, Calcium 4%, Iron 40%. This entry was posted on 3:09 AM and is filed under Duck and Goose . You can follow any responses to this entry through the RSS 2.0 feed. You can leave a response, or trackback from your own site.